You Are Here: Home » High Index Lenses » 1.74 High Index Lenses, Transition Lenses, Progressive Lenses… What Does It All Mean? Wearing glasses for many people is a way of life, especially for those of us who have been wearing glasses much of their conscious lives. When you’ve been sporting spectacles since elementary school (or picked up the need later in life), other non-glasses-wearers will assume that you know everything there is to know about the glasses and lens crafting industry. We don’t, of course. Wearing glasses doesn’t give you a psychic link to the industry or come with an automatic subscription to a lens crafter magazine. For the most part, getting glasses is a simple interaction with your optometrist and optician. They measure your eyes in the dark room with the big machine, you pick your frames, you wait a few weeks and get the new glasses fitted. Problem solved, right? If you’ve bought a new pair of glasses in the last ten or twenty years, you’ve probably noticed a few things changing somewhere between leaving the optometrist’s office and getting your new pair of glasses. The questions your optician asks, for instance. When the nice person in the frames shop asks you if you want High Index lenses, Transition shade lenses, or for your bifocals to be made into Progressive lenses… what do you tell them? For most glasses wearers, your first encounter with these questions is a complete mystery. What are high-index lenses and why is your optician sure you want them? How do transition lenses work and will they be useful to you? And for those of you with bi- or tri-focals, are progressive lenses really better than the traditional way? Those of you who have been wondering about one or more of these shiny new options for your everyday glasses, that’s exactly what we’re here to talk about today. With each option, we’ll offer a TLDR summary to help you make a decision fast along with an in-depth discussion of how the lens technology works and why your optician is so sure you’ll be interested. Lens technology has been an ongoing science since the first monocle was crafted. The shape, thickness, and quality of a lens matter a great deal both to how useful they are for vision correction and how comfortable they are to wear. Many adults alive today still remember the coke-bottle glasses of the mid-1900s and how thick lenses used to be for prescriptions of any real strength. With each passing decade, glass and plastic lens crafters have found ways to make lenses thinner, lighter, and easier to wear. Long story short, high index lenses are the furthest we’ve come in the art of making lenses thin. The higher the index, the thinner the lens. This has been done with high-end plastic manufacturing and has recently hit its peak with 1.74 index lenses which are the thinnest available on the market in plastic. For a slightly heavier and more breakable option, you can thin them out to 1.9 but these require very delicate care for nearly invisible lenses. To really understand high-index lenses, you need to know what the “index” means and why being “high index” is better. Normal glass and plastic lenses have an index of 1.5. The width of lens you’re used to is based on this index. The index itself actually refers to the “Index of Refraction” which is how quickly light can move through the material. The higher the index of a lens (or any transparent material), the denser the molecules are inside the material. This causes light to move slower which causes it to bend. You can see this effect when looking at a straw in a glass of water. The straw looks like it bends slightly after it passes the water’s surface, but you know the straw is not bent. This is because water has a higher index of refraction than air does. Glasses work exactly the same way. Light is bent in a specific way through the lens which serves to correct the flawed natural lenses over your eyeball. The reason stronger glasses are thicker is because the light has to be bent at a more extreme angle to correct the vision problem. High index lenses bend light more efficiently because they are denser without being thicker. And for those of you who are wondering, yes. 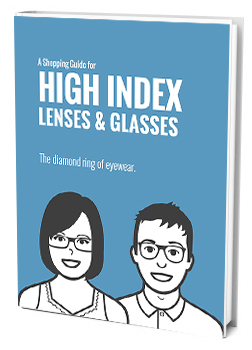 High index lenses are ever so slightly heavier per square-inch of material because of this. Unless you opt for glass lenses, the highest index you can choose from is 1.74. This is the absolute thinnest that sturdy, lightweight plastic lenses can get which is a full 35% thinner than traditional lenses, However, the thinnest index might not actually be the right choice for you. Incredibly thin lenses are specifically for people who struggle with thick lenses in the first place. If you have a strong prescription and often see your lenses flaring out around your frames, higher indexes like 1.69 and 1.74 are a good idea. For those of you with less intense correction needs, consider the 1.57 to 1.67 range of indexes, as these will bring your lenses down to the thinnest practical width. Going for too high of an index can result in paper-thin lenses that will be more prone to breaking or become too thin to set into frames. For literal centuries, glasses wearers have struggled with the need for both corrective lenses and sunglasses. Wearing glasses all the time is no big deal unless, of course, you’d rather be wearing shades and can’t because the space is filled. There have been many creative solutions, some better than others, including over-shades, clip-on shades, and simply having a second pair of frames for prescription sunglasses. Just as high-index lenses are the latest technology has to offer for thin lenses, transition lenses are the cutting-edge answer to the glasses-shades conundrum. LensesTransition lenses are a special coating that goes on your prescription lenses, no matter what kind of prescription you have or index you choose. This coating reacts to the ambient light, darkening when you walk into bright sunlight and clearing again when you go back to the dimmer indoor envionment. This effectively solves the problem of prescription sunglasses by making an all-in-one solution. The technical term for what is done to make lenses transition is “Photochromatic” coating. In other words, color (chroma) that responds to light (photo). Transition is actually the best-known brand of photochromatic lenses and, like Kleenex and Band-Aid before them, have become the functional word for the product. Photochromatic coating is not universally light reactive. It is usually attuned to a special type or intensity of light. The most common is UV sensitivity, which is how the lenses respond to the sun but not your office lights. However, there are unique variations including blue light protection that will activate in offices or pure light intensity response for people who might normally where slightly tinted lenses for eye sensitivity reasons. You can also find transition lenses that provide variable polarization as well, unique to the Transition Vantage line. You may have heard about issues with older versions of transition lens technology in which the lenses responded badly to extreme temperatures or did not clear all the way. It’s important to realize that transition lenses have been around longer than you may be aware and in the last five years, most of these issues have been corrected by fine-tuning the photochromatic coating formula. There are a variety of transition lens options for a discerning glasses wearer and picking the right one should be about your lifestyle and preference in sunglasses. You can choose a formula that provides more or less final shade, depending on how dark you like your shades. Most transition options have 100% UV protection and you can also look into blue light blocking or polarization as well. If you have concerns about light sensitivity, talk to your optometrist about which transition formula might work best for you. Progressive lenses are yet another high-tech solution to a long-time problem with eyeglasses. Many people need correction not just of the middle-distance, but also to work comfortably up close, at the computer, or at a longer distance for driving. This is what leads us to the use of bifocals and trifocals. Once, this was the most advanced lens crafting technique in the world, the ability to embed a slightly different prescription of lens into the same piece of glass (or plastic). Progressives were given their name because of the way they handle the need for multiple prescriptions in the same lenses. Rather than inserting another piece of glass into the lens, they instead figured out how to work a single piece of plastic or glass to provide three phases of vision correction. The bottom is for close work, the center is for computer or intermediate work, and the top half is for distance. Most progressive lenses are effectively trifocals with fuzzy side zones. Progressive lenses are all one piece of lens material that can provide for three different layers of distance sight for your prescription. They do this by flexing the lens material inward, sacrificing some of the peripheral clarity in order to create the correct bend-shape for the central prescription phases. Imagine a piece of thin but rigid plastic, bent outward with your thumbs so the center of the plastic flexes out while the sides flex in where your thumbs are. This, combined with precise varied thickness and angle of the arced lens throughout the progression, is what makes progressive lenses work. The one major concern is that the sides (where your ‘thumbs’ are to the right and left of near and intermediate sight are blurrier than they would be in other glasses. In other words, you will lose some clarity of your peripheral vision in order to get a trifocal effect without the lines. Progressive lenses aren’t for everyone, but those that choose them enjoy them intensely. 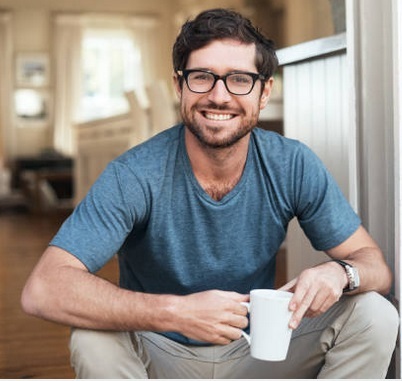 Depending on your career and self-image, progressive lenses can allow people with very bad eyes to hide their need for multiple prescriptions and avoid the stigma of bifocals and trifocals. Like high-index lenses, progressive lenses are a purely aesthetic choice that will make your glasses sleeker and less noticeable overall. Combining high index lenses with progressives can allow you to completely hide a strong prescription. Of course, the right choice for you will depend both on your need for sleek glasses as part of your lifestyle and your own self-image. Are high index, transition, or progressive lenses right for you? Now that you know what they are, you can make the decision for yourself.